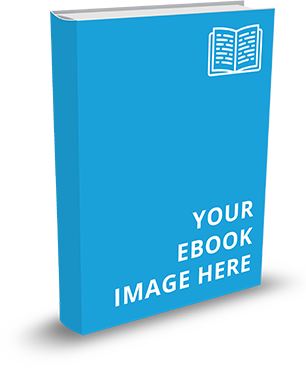 Get Your Free Program Retention Tool Today! Retaining fathers in a fatherhood program is one of the greatest challenges many organizations face. That’s why National Fatherhood Initiative (NFI) is committed to providing tools and guidance to help meet that challenge. I’m pleased to introduce a free downloadable Reminder Card for the 24/7 Dad® A.M. and P.M. programs and the Understanding Dad™ program for moms. We created English and Spanish versions of each one. Before you read on, take a moment to view the cards (English versions) for each program. Don’t let the simplicity of a Reminder Card fool you. This powerful tool can help you increase the likelihood that fathers and mothers will return to subsequent sessions of the programs. It is based on research on planning prompts, which involve prompting people to plan when they’ll follow through on and engage in a beneficial behavior. Research on the use of planning prompts has shown that simply having people write down the date and time when they’ll engage in a healthy or pro-social behavior dramatically increases engagement in that behavior. Planning prompts can be even more effective when people make a commitment to engage in a behavior in front of/in the presence others. The Reminder Card is, in other words, a planning prompt. Print enough reminder cards for every participant to complete at the end of each session, with the exception of the last session. 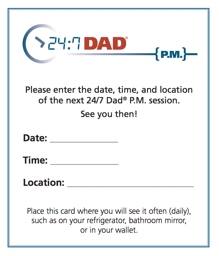 If, for example, you have 8 dads in your 24/7 Dad® AM program, make 11 cards for each dad for 88 total cards. Print them on card stock so they have the look and feel of a business card. Fill in the name of your program in the space that appears in the following sentence at the top of the card: “Please enter the date, time, and location of the next _______________ session. See you then!" The card includes this space because some organizations have a different name for their program (e.g. Dads Matter or Fathers Forever), even though they use a NFI program as its foundation. 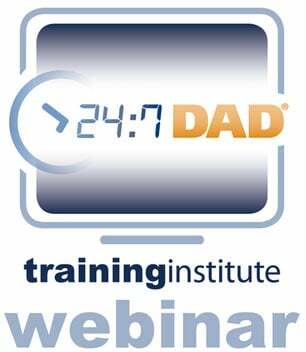 If, however, you call your program 24/7 Dad® or Understanding Dad™ as many organizations do, simply enter the name of the NFI program. Tell the participants to fill in the date, time, and location of the next session in the corresponding spaces. Then share that information, even though it might not change from session to session. Do not complete this information for the participants. They must complete it for the card to have maximum effect. The first time they complete a Reminder Card, draw their attention to the following sentence at the bottom of the card: "Place this card where you will see it often (daily), such as on your refrigerator, bathroom mirror, or in your purse or handbag." Then ask participants to share where they will place their card. This conversation will further instill the importance of the card and provide ideas for participants on where they can place their card for frequent exposure to it. At subsequent sessions, ask participants whether the placement of the card worked for them and, if it didn't work, for ideas on where else they might place it. Get ideas from other participants, if necessary. Text or email the participants between sessions. Include the date, time, and location of the next session. 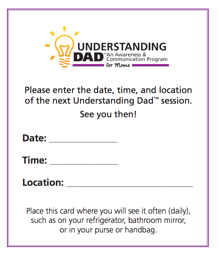 Assign participants to pairs of “accountability partners” in which the dads/moms in each pair call (or text or email) each another ahead of the next interaction to remind each other to attend. If you use this tactic, consider having the participants write the name of their accountability partner on the Reminder Card. Please let us know how well the Reminder Card works for your program! Are you doing everything you can to retain participants’ consistent participation in your program? Is there any reason why you shouldn’t integrate this free research-based tool? Article from Knowledge at Wharton: Small Steps That Make a Big Impact on Achieving Goals. Martin, S.J., Goldstein, N.H., & Cialdini, R. B. (2015). 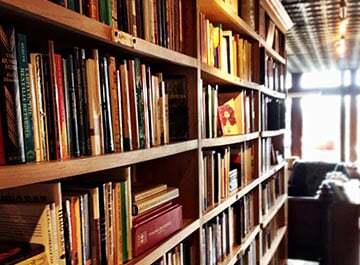 The Small B!g: Small Changes that Spark Big Influence. London: Profile Books LTD.